If you are looking for most recent fresh proxy server list then register to our proxy board or become sponsor and you will have instant access to hundred working proxy servers update daily. If you have any question or problem regarding explained tutorials below do not hesitate to ask us on our forum. Let see how it works with AATools.With this program from glocksoft (75 dollar) you can analyze hosts and services that are started on these ports Open AAT and then go to the Port Scanner.You can use port scanner from AAT to analyze hosts with any open ports 1080, 80, 3128, 8080, 1029 etc. We going to enable TCP scanning under Policy. Under port set we gonna to chose Proxy Ports Chose ping 10, connect timeout 10 or 15 and threads 30 We going now to set up what ports we need for scanning Go under Port set and chose Proxy Ports NOw you can see what are automatically chosed proxy ports LInks side we can add new ports or chose one of many ports that we want to scan.\ This picture show how to add ports to scanner Chose setting Under socks proxy type your working Socks.It is needed for scanning behind socks and not your own IP. Type one range and click on Lookup The same ranges come on picture above.Change manually to desired value. Click on ADD.Your ranges appears under Host to Scan and now just click on Start Sygate show that you scanning behind socks Port Scanner have found in our example one open ports.If you are system administrator do not panic. You can copy it to AATools proxy scanner and test thereagain for example to examine of you these mistakenly left open.. Good luck with examining! Socksify your appz using SocksCap - Tutorial with pictures!! --------------------------------------------------------------- When you open sockschain then go to Tools - Option - General and select as on the picture below (faster connection chose higher threads-timeout is depend on you.5 second is very well). : Go to the proxy and upgrade and then chose as on the picture below (it is import that you disable any interaction with ufasoft): Next section is Tools - Proxy manager.As fist chose update list and then test all.Proxy/socks checker of sockschain works enough to show you which proxy/socks works or not, but not very well as Charon, AAtools etc: After finishing of testing click on Service - New and you'll get screen as below.Right side are tested proxy/socks.You can added socks/proxy to chain with simple selecting and then click on ADD as on the picture. On left side we can chose name of chain (not import) and port of local server.We chosed port 1088.It is import that you do no have any active connection on this port.Disable auto creating chain (sockschain rotates the proxys/socks in a random order): Click on ok then go to Internet explorer Tools -Internet Option - Connection - Lan Setting - Advanced and input as on the picture below: Go back to Sockschain and click with right mouse button on field application and add your IE: Start IE and you'll see inside sockschain creating of chains on the way to google: Configuration and execution of IE through chain of socks/proxy using Sockschain ended with success. ----------------------------------- Frist follow procedure explained above for sockschain.Then open Mirc and be sure to set it up as on the picture below. 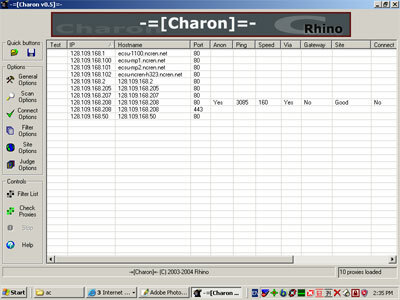 After setting it up then click on connect and you'll be connected to mirc in this sample through chain of 2 proxy/socks. Good luck!!! Angry IP scanner seems to be very attractive for analyzing networks and scanning ports because of his speed.It is very fast, many people use them and together with Superscan one of the fasters scanner. However i must say that ultimate networks and scanning ports program especially for finding proxy is proxyhunter. With AIS you need to export all host with open ports and then test all of them with one of many proxy tester. AIS is small and very fast.At least 2-3 times faster than ProxyHunter. Let's back to our tutorials. It is almost done all from first starting of programs.So big knowledge to system administrator is not needed to configurative this program for analyzing open ports of hosts. Let';s first go to option.Option and select columns is not needed to change (you can play by yourself with option and there is also very detailed help file from author for every single option.) We should go over first 2 option and then just take a moment for third option select ports. 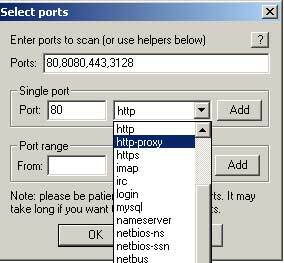 You have choice from selecting many ports but usually proxy common ports as 80, 8080 and 3128. We added by also ports 443 https port! Simple click on start and go take a one black coffee. During scanning some of dot appear on your screen: Green means open port and alive server on specifed ports Red means dead server Blue means alive server but we could not find open ports because we have specifed only a couple ports (80, 8080, 3128, 443) and server is not open on any of from us specifed ports. After scanning has been finished delete dead proxy as on the picture below. Then export all server to .txt file. AIS have unusual format to import servers for retesting.Only program that support AIS fromat is Charon. (Alternative may be to you site from Guardian http://clan.cyaccess.com because you may find online converter to format ip:port ) . 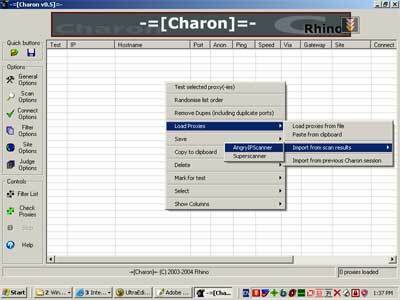 Open Charon and import it as on the picture below. Test all server and in our example we find only one working as anonymous proxy. And scanning took only 30 secund. Good luck!